Hello! Meet with me the paper artist Kjersten Anna Hayes in Kuala Lumpur today. 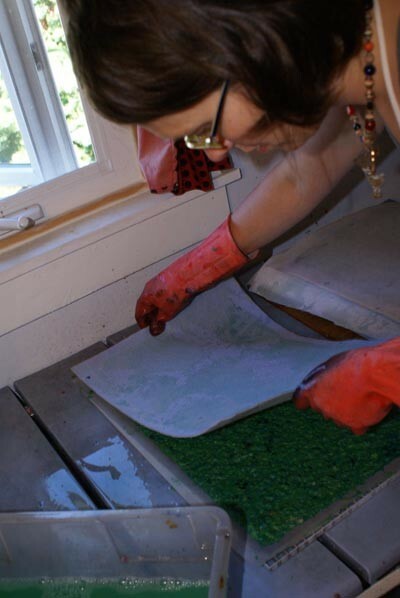 She makes colorful journals and books for which she makes and dyes much of the paper herself that she uses in her cover designs. Hi, Kjersten. I mentioned in the announcement you are in Kuala Lumpur, however, in your shop it says you are located in the United States. Please explain: Where do you work and live? I have a dreamy studio with a sink, a tub, and blue ceilings in my home in Bellingham, Washington where I usually live and make art. But! For the last year I’ve been living and making art in Kuala Lumpur, Malaysia, while my husband carries out a two-year assignment here for his job (my sister has been baby-sitting my Etsy shop and shipping orders for me while I’m gone). 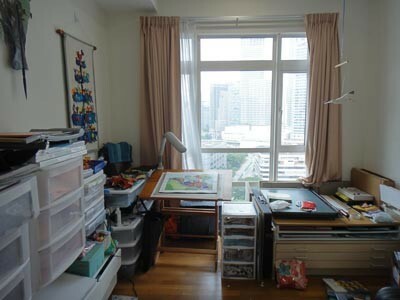 We hauled my most important supplies over the ocean, and managed to arrange for a condo with an extra bedroom, so I can still make paper and art here. The picture shows my current studio in Malaysia. How exciting! Have you made contact with local artists there? And do you think the change of location has an influence on your style? I have visited various craft studios, including some paper artists. For example I recently visited a traditional Malaysian kite maker in the North who cuts and layers intricate patterns on his kites using paper. I’ve visited other handicraft studios, puppet-makers, weavers and others, but only as a tourist. I plan on taking an extended Batik class at some point, maybe I’ll at last make more personal connections with other crafty people there. I do think living here has had an influence on my art but it’s hard to pin-prick exactly how. So far it’s clear that it has inspired me mostly with new subject matter for the illustrations I make. Some of the things I’ve found inspiring to me here are the Islamic patterned decorations on many buildings, the tropical flora and fauna, and the bright colors of batik dresses. I have been an avid journaler my entire life. I stapled papers together to make books (usually storybooks I’d write and illustrate) when I was as young as 7 years old. I also had a wonderful and creative teacher in 2nd, 3rd and 4th grade who created every year’s entire curriculum around a pretend trip, either to a foreign land or back in time. 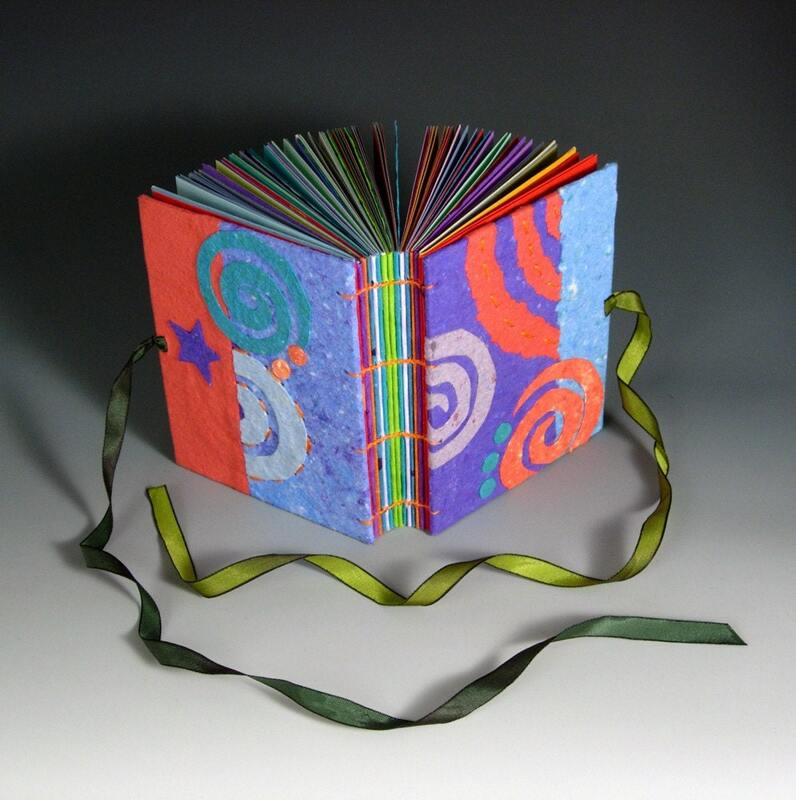 In her class we made oodles of books and journals – writing journals, science journals, sketch books and my favorite – the big thick handmade scrap book that we glued all of our best school work in to keep as a chronicle of our pretend adventures. That same teacher gave me a real travel journal when I was 10, for a trip I was going to take with my family to Europe. 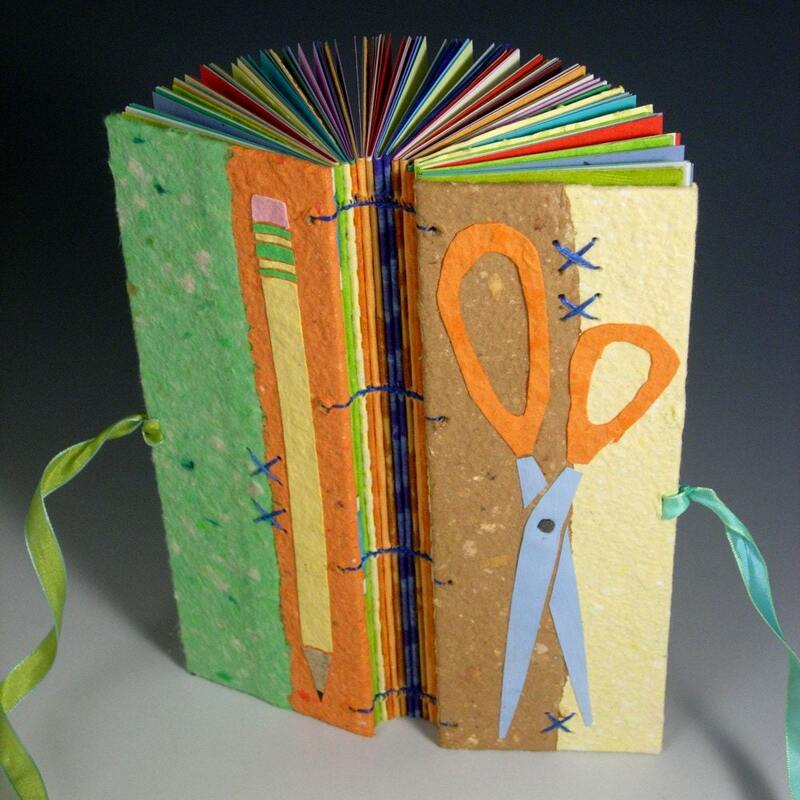 That got me going with filling my own personal journals, and then when another teacher introduced me to book binding in Jr. High School, I was hooked. How does your bookmaking for your Etsy Shop fit in with the rest of your work- and private life? Is it complementary or in competition with other endeavors? 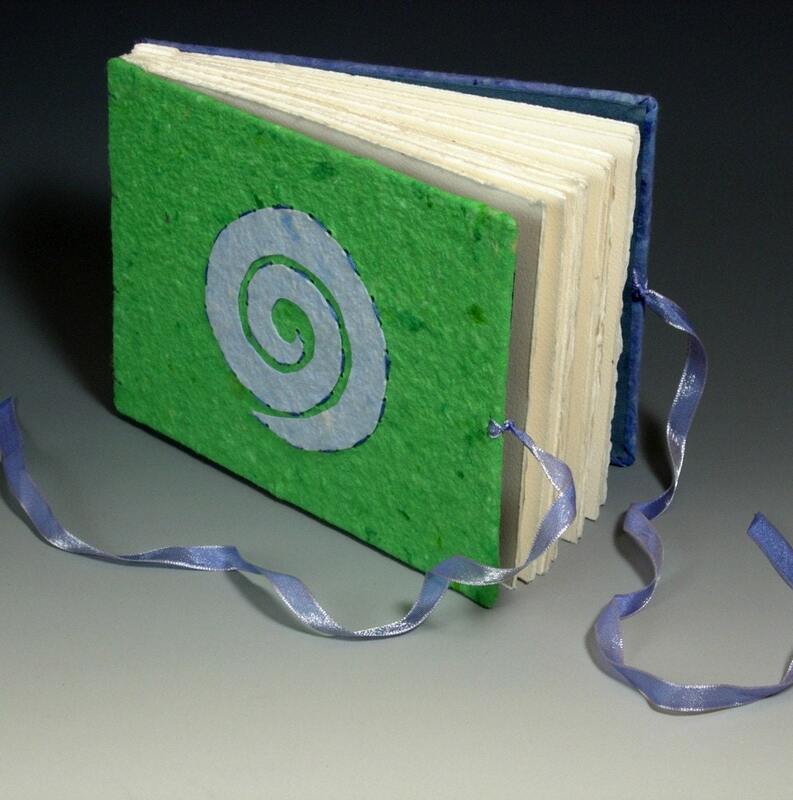 I consider myself a paper artist, and that has encompassed many facets, including making and selling handmade books. I used to do many, many big craft shows, and I truly loved the process of hand-selling my art and connecting with people one-on-one in that way. But four years ago I took a leap and decided to take an extended break from craft shows while my son was young (he was a newborn then) to focus on another aspect of my paper art that I’d also been working on for as long as I’d been selling handmade books – writing and illustrating for children. On the surface it sounds like a separate pursuit, but for me, they are definitely heavily related. For example, I make a lot of the papers I use in collages on the covers of the journals and photo albums that I sell and I use those same papers in the collage illustrations I make my children’s book work. Also, each handmade book I’ve made over the years has been like a color or texture study, helping my collage medium become intuitive. Like any regular practice or studied discipline will do, making so many handmade books has settled skills into my bones, veins and heart that influence my color palette and my use of paper in my illustrations. Would you like to present one special piece of your work? Is there for example a book that you made and especially like? I’ve filled suitcases full of my own personal journals – full of stories and narratives that I’ve written or made visual (related to both book making and writing and illustrating). The narrative book form enchants me. I can’t help but fill journals. And of all the journals I’ve made and filled, my favorites are my travel journals. Some I’ve made as I’ve taken the trip. Others have been like giant collage pieces I’ve put together after-the-fact. I also made what I call a book dragon once. It was a journal chronicling the making of one of my collage illustrations. I had a lot of fun with the piece and even made a video about it! Tell us a little more about your shop and your crafting: What exactly do you make and sell? I like to focus on the inside of my handmade journals nearly as much as I focus on the cover and the binding, and I think that’s what set my books apart at craft shows in the past. I like filling journals that feel like playgrounds – inside and out – not just with the cover and binding, but also with the pages. This is why I use lots of colorful paper inside my journals, and work on the pages being a part of the overall design. I also use a lot of my own handmade papers in the cover designs of my books, so paper-making is a huge aspect of all of the art that I do. I’m planning on adding prints of my art illustrations to my etsy shop by September of this coming year, which is something that has been in the works for quite some time and I’m very excited about making it happen. Good luck with that, adding your prints and illustations sounds interesting! Will we see some of your children's books in your shop then? Thank you, Kjersten, for taking your time for this interview! Thank you for your interest! In honor and gratitude for this interview, yesterday I started a series on my blog that might be of interest to readers here. The series is entitled “SELL OUT!” and it will include weekly tips for the next 6-8 weeks on being a better and more dynamic salesperson at craft shows, without loosing your soul or compromising your integrity. I’m basing the series on what I’ve learned from years working shows myself, as well as what I learned working as a salesperson at a small and highly successful handcrafted pottery retail store for many years. I hope you’ll join me for the series. If you are curious now, go and visit Kjersten's Etsy Shop to browse her shelves. You can also learn more about her on her website, and of course you shouldn't miss a look at her blog. gorgeous work! what a grat read! Wonderful interview, Kjersten! 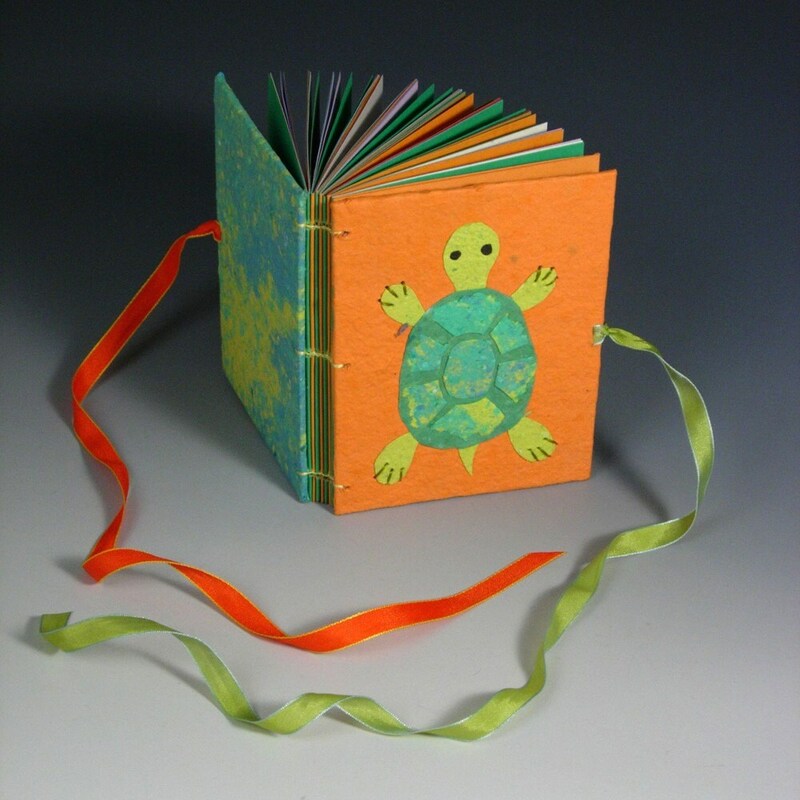 I admire the way you use your handmade paper in your artwork and books. Papermaking is not a simple process. I would probably hoard mine if I ever learned how to make it!